Conspiracy theories have never been strangers to Republican circles. The most notable since the 1998 Belfast Agreement, is that so-called ‘securocrats’ are involved in a conspiracy to discredit the leadership of the Provisional movement and undermine the peace process. (1) Securocrats can be defined as “disgruntled members of the security forces who want to force Sinn Fein out of government.” (2) The securocrats allegedly pull the secret strings of Northern Ireland. “These men, skulking in corners of the army, MI5, Special Branch and the Northern Ireland Office, form… a ‘shadow government’, bent on forcing its own, reactionary agenda on the province. In this view, their driving purpose is the defeat, discrediting and humiliation of Sinn Féin and the IRA – regardless of the policy pursued by Tony Blair and his ‘official’ government in Downing Street.” (3) For example, last December the late Denis Donaldson was exposed as a British agent. He had been one of three officials charged with spying on other political parties at Stormont; the alleged ‘Stormontgate‘ plot discovered in October 2002. The Provisional leadership insisted that this was proof that the spy ring had never existed and that the whole Stormontgate affair had been set up by the securocrats. “It was a British spy ring controlled by securocrats, by people within the establishment who are hostile to the peace process” declared Martin McGuinness. (4) This is questionable. Far from launching the Stormontgate affair to give the then Ulster Unionist leader David Trimble an excuse to walk away from power-sharing with the Provisional movement, the securocrats took the view that Mr Trimble should ignore the spying scandal and stay in government. The Provisional movement also frequently allege that there is a conspiracy between the media and the securocrats, with journalists becoming a willing participant in the so-called ‘dirty war’ by spreading “misinformation” to attack Sinn Fein and the Peace Process. When the so-called ‘Stake Knife’ affair broke out in May 2003, the Provisional leadership denied everything and blamed the collusion of securocrats and ‘journocrats’. “All of these stories are coming from nameless and faceless securocrats in British intelligence” said Martin McGuinness. (13) The peace process has indeed corrupted journalism, but not in the manner alleged by McGuinness. Quite the opposite in fact. The media has been accused by award-winning journalist Ed Moloney of covering up truth to protect the peace process and being reluctant to report events unhelpful to the peace process. (14) For example, when in October 2000 the Provisional shot dead Joe O Connor in Ballymurphy, their involvement in the murder was mostly brushed under the carpet by the media. Reporters and editors sympathetic to Sinn Fein’s strategy branded journalists who asked awkward questions (such as Ed Moloney or Suzanne Breen) “JAPPS – Journalists Against the Peace Process”. It would be more accurate to say that the peace process has in fact produced Journalists Against Journalism. The securocrat conspiracy theory may be flawed, but it brings two political benefits for the Provisional movement. First it allows to present itself nationally and internationally as a perpetual victim; which is electorally advantageous. Secondly, it allows to shift the blame for deadlocks in the peace process away from itself to ‘securocrats’, ‘malevolent blanketeers’, ‘japps’ and other ‘enemies of the peace process’. But the cost has been that crying securocrat wolf too often has ultimately undermined the credibility of the Provisional movement. Every time the Provisional leadership cries out ‘securocrat’, only the faithful believe. Undercover soldiers in Northern Ireland would celebrate the shooting dead of a terrorist suspect with a cake adorned with the victim’s name in icing, it emerged yesterday. The BBC released a photograph of one of the cakes, in the shape of a cross, baked to mark the SAS killing of the IRA man William Price, 28, in Ardboe, Co Tyrone, 16 years ago. It was marked RIP, with his name and where he died. The reporter Peter Taylor discovered it when interviewing members of the security forces for Brits, the BBC2 series on the role of intelligence during the troubles. They often kept memorabilia, including snaps of shot suspects, and the cake photo was no big deal to them, he said. In tonight’s episode, a member of 14 Intelligence Company, an undercover army unit, denied there was any shoot to kill policy. Soldiers adhered to the yellow card stipulating when they could legitimately open fire, she said. But they would mark the killing of suspected IRA volunteers. Price was shot four times in July 1984 as the IRA planned an incendiary attack on a factory to coincide with the death of the hunger striker Martin Hurson. The SAS was laying in wait. Two soldiers told the inquest they had opened fire fearing Price was about to shoot. He was hit in the legs and then in the head as he was in a sitting position. 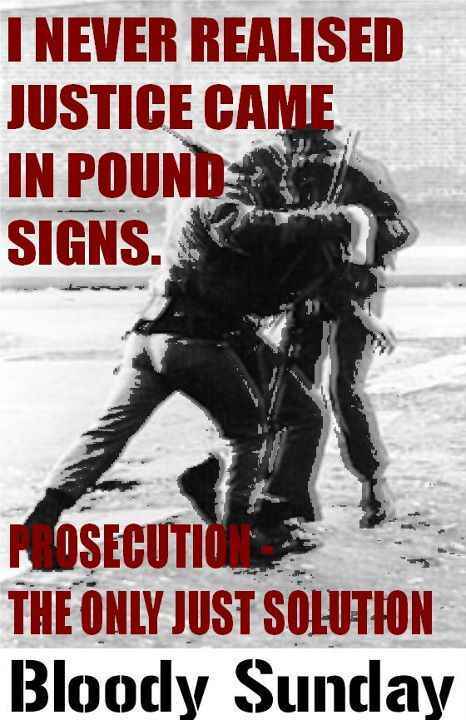 An IRA statement at the time said Price was scouting a way to the factory with another IRA man, adding: “When they got within 20 yards or so of the bushes, three to four figures rose in front of them, and suddenly the whole place lit up with gunfire. William Price fell moaning. The other volunteer crawled back through the long grass to make his escape. A private in the parachute regiment said on the programme that he had arrived on the scene after a shootout in Belfast between undercover soldiers and the IRA. It was hard to know who the enemy was. He began dressing the wound of an injured with his own shoulder dressing, reassuring him. The victim was going blue when the private learned he was an IRA man. • David Trimble‘s plan to return to power sharing with Sinn Fein is to be challenged with alternative proposals by opponents in his Ulster Unionist party. They would be put to the party’s council before Saturday’s crucial vote, said Jeffrey Donaldson, MP for Lagan Valley, and would deal “with the issue of arms and the issue of government.